I gave you all a hint last week of 2 new tutorials and for today's Tasty Tuesday, I am sharing tutorial number one. 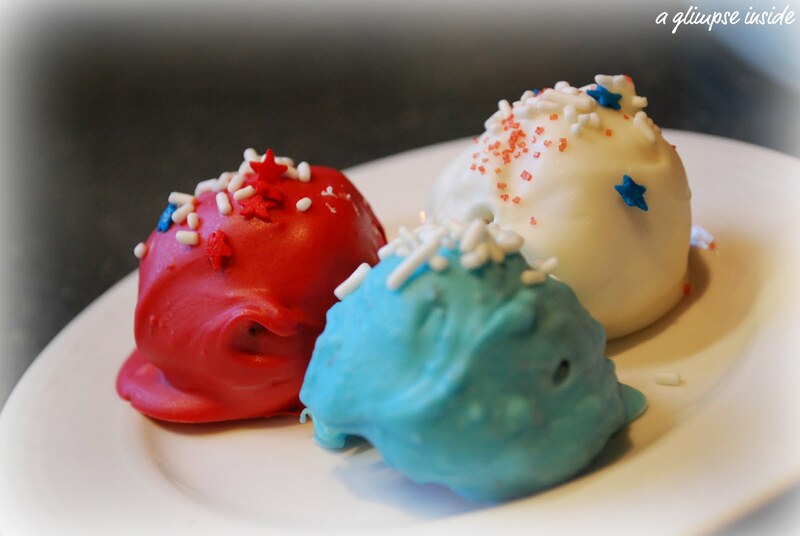 Here is a tutorial on how to make some very yummy Cake Balls. I first saw this on Making Memories... One Fun Thing After Another and I thought it would be SO CUTE to try this for 4th of July weekend and take them to TN. So here is my version of the cake balls which were a HUGE hit with everyone that tried them. -Cookie dough scoop (optional but good to use to make sure they are all the same size). Bake the cake mixes according to the directions on the box. Let cool completely! Once cooled, break the cakes into small pieces. After you break up the cake, add a whole can of frosting to the mix and stir in completely. Try to get icing on all of the cake. This is what holds the balls together. Unfortunately, this is where my pictures end of the making process. My hands were a little messy so it was not a great idea to pick up a camera so I will just write the rest of the steps. -After your icing is mixed in, melt your chocolate. I bought red, white, and blue candy melts so I placed them each in their own bowl. I then just melted them in the microwave but you can melt them in a double boiler as well. -Once your chocolate is melted, grab your cookie scoop and scoop out some of the cake/icing mixture. Now this is where I started to have some trouble. The first few I made fell apart once I put them into the chocolate to cover. So instead of dropping the cake straight into the chocolate, I put them in my hands and squeezed and rerolled them to make sure that they were tight. -Then, drop in chocolate. I found it best to take a spoon and spoon the chocolate onto the ball, and then remove from the chocolate with a fork. -Place chocolate covered cake ball on a cookie sheet covered with wax paper so it doesn't stick. -While the chocolate is still soft, sprinkle with sugar or sprinkles. You could also drizzles more melted chocolate on top. Here is my final result. I made red, white, and blue for the holiday. Some were chocolate and some were white- ALL were delicious! Hope you try these. They take some patience but are well worth it in the end! They would be great for any get together or even a birthday party! If you make them, would love for you to share them with me. Enjoy! I can't wait to try this, it's such a great idea, did you come up with it by yourself? What perfect timing....these were on my list to find a recipe and try. They look so fun with the red, white, and blue! mmmmm cake balls! Great tutorial. Oh dear. I am going to get large and in charge from reading your blog! I want to make everything! I'm just visiting from New Friend Fridays at The Girl Creative or The Trendy Treehouse. I'm a huge fan of cake balls. Have you tried putting lollipop sticks in them to make cake pops? Cute! I haven't made cake balls in two years! Looks delicious! Those look SO good Fattening but GOOOOOD!!!!!!!!!!!! Cake balls are the best:-) you have such a great blog...nice to meet you. Sure sounds decadent! I can only imagine what they taste like! Bring on the strong coffee and cake balls please. :) Heaven! Yum! I love cake balls and these are some of the cutest I've seen. These look adorable and delish! Well done! I know I’m about a year too late on these – but I’m going to make these tonight! So excited!